If you go out for an evening walk or a night of star-gazing, you may have an opportunity to witness the Moon rising, about an hour later each night, and slightly less than completely full right now (waning but still over 90% full on June 30). Above is a digital image of an oil painting by Swedish painter Johan August Malmström (1829 - 1901), entitled Älvalek (literally "Elf-sporting" or "Elf-play"), which is usually translated into English as The Dancing Fairies. In the painting, the artist has depicted a secluded country setting, with a wandering stream, over which a full moon is rising. A mist seems to be moving over the water, and hovering over the grassy meadow, and winding among the more distant trees -- but upon closer inspection we perceive translucent spirit forms in the mist, and discover that what we may at first have taken to be a fog is alive with motion, filled with fairy figures involved in a mysterious nighttime dance. I like this painting for the way it evokes the interplay between the Invisible Realm and the Visible Realm, between ordinary reality and non-ordinary reality, between the world of spirit and the world of matter. In this incarnate life, we are accustomed to what (to us) might be termed "ordinary reality" -- but there is another reality, "non-ordinary reality," which (although not as familiar in our day-to-day life) is just as real: an Invisible Realm which is always present, although not always perceived. The ancient myths describe the reality of this Invisible Realm -- the realm of pure potentiality, the realm of the gods. It is no less real just because we cannot (ordinarily) see it. And the myths help us to understand it by describing it to us using the language of the stars and the motions of the heavens above -- making it visible to us by employing the figures in the glorious night sky above our heads, which itself is an infinite realm into which we can gaze for ourselves in order to learn about the infinite realm which intertwines with and interpenetrates every aspect of this seemingly-material universe in which we currently move. 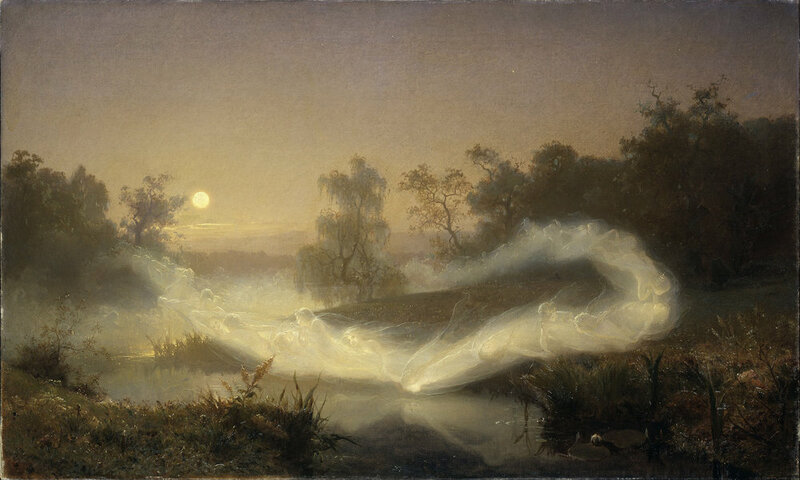 In Älvalek, August Malmström gives us a glimpse of the Invisible Realm, temporarily making itself visible to us, on an enchanted evening as the Moon is rising and the spirits are at play. I particularly like the detail in this part of the painting, because we can see how the artist has created the suggestion of a translucent veil, streaming down from the passing fairy figures, using a few lines of paint to suggest the wisps of the immaterial gauze. I also like the juxtaposition between the plant-life and the spirit forms. As discussed in previous blog posts such as "Two metaphors for the Material and Non-material realms" and "Every fountain has its nymph," as well as in my 2014 book The Undying Stars, the world's ancient myths all appear to teach the existence of a realm of pure potentiality -- the realm of the gods and spirits -- the realm which forms the pattern for this material realm in which potentiality manifests in specific form. In some traditions, in fact, this Other Realm is called the "seed realm," which is a perfect metaphor for this realm of pure potentiality. When still a seed, how many branches does an oak tree have? The answer is that, while still in seed form (an acorn), the potential tree has a infinite number of potential combinations of branches and twigs -- but that once it actually "comes down" from the seed world and manifests in this finite realm, the oak tree will manifest a specific and finite number of twigs and branches. The plants shown above in the image detail from the painting by August Malmström have manifested into specific shapes and forms. The spirits gliding by, however, are ethereal -- they do not have finite forms, because they exist primarily in the Other Realm, and are only temporarily visible in this one. Although we cannot ordinarily see it, this world in which we are moving is actually always in a state of interplay between the finite and the Infinite realms. In fact, as discussed at some length in The Undying Stars, the discoveries which necessitated the new way of understanding our reality which is encompassed by the general label of "quantum physics" acknowledges the fact that at the subatomic level, particles seem to move between the realms of pure potentiality and the state of finite manifestation quite fluidly. Theoretical physicist David Bohm came up with the terms "implicate order" and "explicate order" to describe these states, out of which our reality is continuously "unfolding" and then "folding back" in again. This detail may be the central focal-point of the entire painting. Notice how the ethereal figure gives off her own light, and can be seen (in the image of the entire painting, at the top of this post) to be the brightest area of light in the entire composition, other than the Moon itself. We cannot see the facial features of the spirit floating over the water, but we can see them in the reflection in the still waters of the stream. Plotinus appears to be using the metaphor of a mirror as representative of our condition in this incarnate life. From the realm of spirit, we have made a "leap downward" into this "mirror realm." Out of the realm of spirit, air and fire, we have taken on a form made of the lower elements of earth and water -- much like the spirit in the painting who is contemplating her reflection in the watery stream. But, even though we have descended to this lower realm, Plotinus tells us, we still have a connection to the higher realm -- and indeed we even have a higher part which "holds for ever above the heavens." This reality is a common theme of the world's ancient Star Myths, across virtually all cultures -- and has been discussed in several previous blog posts, including "Eros and Psyche" and "You may have a Higher Self, and He or She wants you to know it." Thus, our condition here in this incarnate life is only seemingly material -- we are actually in a condition of constant interaction between the visible and the Invisible, and we always have a potential connection to a Higher Self who never left the spirit realm, even though we often do not avail ourselves of that opportunity. Finally, note the path which the coursing spirit company is taking across the lonely countryside in the painting. They appear to be making a circuit or a loop -- but not just a simple loop. Rather, they are making a large figure-eight through the meadow and around some of the distant trees along the rolling hillocks. The sideways figure-eight, of course, is a symbol for Infinity, as August Malmström would undoubtedly have known, whether he consciously planned that out for his painting or not (perhaps he did not even think about the connection to the symbol of Infinity, but merely painted the fairy host as he saw them one night in the countryside, or as he saw them in the vision of his mind, inspired by his Higher Self). However it came about, this aspect of the painting only reinforces its depiction of the presence of the Infinite and Invisible Realm around and among us at all times, although most of the time we do not even perceive it. Malmström appears to be telling us to open our vision and become more attuned to the present reality of this spirit world, all around us. If it is at all possible to do so, he seems to be saying, it is good to get out into a secluded night-time spot, such as the one he chose to depict in his painting, in order to perceive the Infinite Realm as it courses around and through our supposedly "ordinary" reality. Those interested in seeing the close-up details of this provocative painting by August Malmström from 1866 can go to this high-resolution image of the original, where you can zoom in to the level of perceiving even the brush-strokes in some cases. If you direct your gaze skyward in the painting, you will even be able to perceive a few stars. The Invisible World is all around us, at all times, and we ourselves possess an inner connection to this Infinite realm, if we learn to avail ourselves of it. Malmström's Dancing Fairies impresses upon our senses the truth that this Infinite world is always interacting with the finite realm, and the importance of becoming attuned to that reality.